The leader of civil society in a program organized in Birgunj said that the federalism will be in crisis if the election is not held on time. 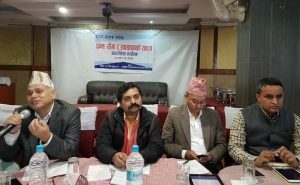 In an interaction program on Madhes problem, province demarcation and autonomy organized by INSEC on January 28, the leaders of civil society and intellectuals in one place discussed about the present political situation of the country. The intellectuals from Madhesi and non-Madhesi community openly counseled about the present Madhesi’s problem. Speaking at the program, INSEC chairperson Subodh Raj Pyakurel said that all people are Nepali who lives in this soil. He said “ If I talk about your rights and if you talk about my rights, that is human rights.” He added , if someone only talks about his rights, that is demand. He further said that constitution is a philosophy and it must be enforced by making law. He emphasized on conducting election on time. The program was participated by advocate Panna lal Gupta, Birendra Yadav, Ramsisham Yadav, professor Suresh Kushawa, Professor Dr Sushma Tiwari, Professor Uma Mishra. The participants stressed that the problem must be solved through democratic methods. Speaking at the program Dr Rajesh Ahiraj said that there were never discrimination against Madhesi in Nepal however stressed to end racism.